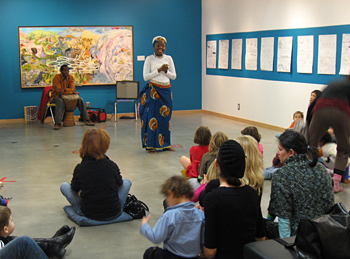 The ArtStarts Gallery was packed on Saturday for two invigorating African Dance workshops with Maobong Oku. 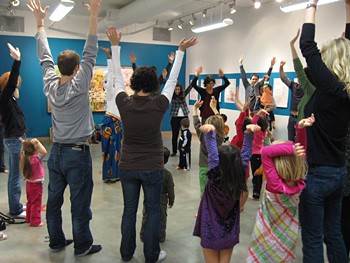 Kids and parents got a workout as Maobong led them through a series of different dances that celebrate Nigerian culture. Maobong explained that dancing allows us to connect with and celebrate the earth, which is why African dancers dance barefoot! Kids got to try out some traditional calls, and a few even practiced their drumming skills. Stay tuned for more photos of the event! Maobong's workshop left everyone smiling, and excited for the next series of of ArtStarts on Saturdays events, which will kick off in January with an interactive musical performance by Bobs & Lolo. Check back soon for more info on the upcoming series. Many thanks to the TELUS Vancouver Community Board and the Leon & Thea Koerner Foundation for their generous sponsorship of the ArtStarts on Saturdays series.